An innovative book, WHEN FICTION AND PHILOSOPHY MEET explores the intersection between the philosophy of Simone Weil from Paris, France, and the fiction of Flannery O’Connor from the Southern state of Georgia, USA. In an era of war, of unprecedented human displacements, and of ethnic, racial, and religious fears the ideas of these two intellectuals bear on our present condition. Both women keenly desired to perceive the realities of good and evil inherent in human existence and to bring this truth to the consciousness of their contemporaries. Embracing their belief that truth is eternal but must be transposed and translated, generation after generation, in language appropriate to each age, the authors acquaint O’Connor readers with concepts in Weil’s religious philosophy as seen in O’Connor’s stories. Doering and Johansen simultaneously illustrate how Weil’s philosophy, when embodied in fiction, reveals the lived realities of the human condition across time and space. Simone Weil and Flannery O’Connor were audacious thinkers with inquiring minds who held clear and firm religious convictions. Each applied her understandings of enduring spiritual truths to the challenges of nihilism and social oppression as seen in the spreading totalitarianism and the distressing legacy of slavery throughout human history. Both Weil and O’Connor crossed disciplinary boundaries and influenced their respective fields with innovative ideas and artistic expressions. Taking their cues from these writers, Doering and Johansen bring these two remarkable women into a four-voiced dialogue--Simone Weil and Flannery O’Connor with Doering and Johansen--by engaging each writer in the forms of her own genre and inviting readers to enter a dialogue of courage with Weil and O’Connor in the postmodern and post-Christian world. 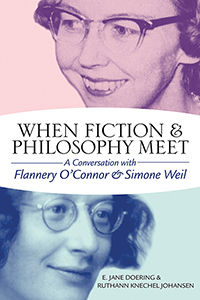 WHEN FICTION AND PHILOSOPHY MEET, rather than simply insisting on specific connections between Simone Weil's principles and Flannery O'Connor's works, welcomes scholars into a dialogue between the two great figures, on such topics as how evil mixes with good, how we amuse ourselves with lies, how to build a bridge between the natural and supernatural, and how we might understand action and nonaction, decreation and death, violence and beauty. The reader is invited to contemplate and appreciate the powerful ways in which Weil intrigued and inspired O'Connor. Doering and Johansen's meticulous juxtapositions of Flannery O'Connor's fiction and Simone Weil's philosophy are so apt and convincing that a reader can only wonder why such a full-length study hasn't been undertaken before. The scope of this concise book, from Weil's Platonism to O'Connor's engagement with the racial tensions of her day, should make it appealing to anyone interested in the ways these two giants of twentieth century thought approached the intersections of politics, philosophy, religion, and literature. Doering and Johansen have done something quite remarkable. They have taken two twentieth century writers often perceived as difficult and used them to illuminate each other’s work. In their capable hands, O’Connor’s “grotesques” and Weil’s struggles with the forces of evil are revealed for what they are: media through which the divine communicates. Like the authors they write about, Doering and Johansen bring us meditations on truth, grace, beauty, right action, and all that transcends. This innovative and interdisciplinary collaboration explores the writings of two great voices of the last century, Flannery O’Connor and Simone Weil, each of whom wrote against the conventions of her age. Profoundly influenced by the Catholic tradition, each held to a sacramental view of this world, while resolutely facing the reality of human evil and suffering. By suggestive juxtaposition and by fresh insight, Doering and Johansen offer creative readings that will delight many. There is something for everyone in this book. Doering and Johansen bring two major figures from two different fields into rich dialogue with each other. This study is valuable for those familiar with both writers and well as those with minimal knowledge of them; it lays out the significant biographical markers of their lives and the experiences that fed into their thought as well as the sweep of their careers and oeuvres. For such prolific and significant writers, this represents no small feat. Doering and Johansen have done us a great service in exploring the commonalities and kinship of these two great writers of the mid-twentieth century. Their “conversation” evokes the richness of what Great Books advocates call “The Great Conversation,” and the Red Virgin and the Red Clay Virgin are splendid nominees for the Canon, as the authors show here.